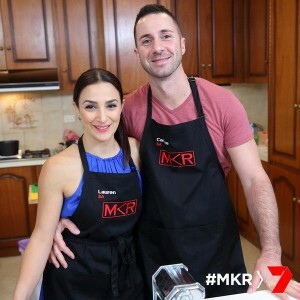 It is the last instant restaurant in the redemption round, Carmine and Lauren cook, but which two teams will be eliminated from MKR tonight? Last time they cooked, Carmine and Lauren scored 51. The married Italian couple from SA had some bad seafood dishes. Tonight they are trying again with seafood to redeem themselves. 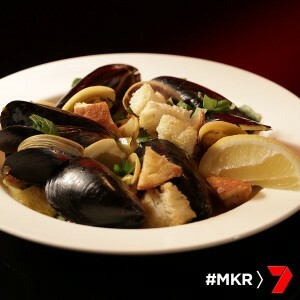 For entree, they are making saffron cockles and mussels in broth with croutons. 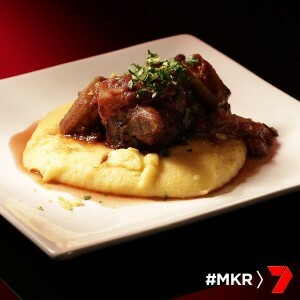 Main course is oven baked lamb shanks with soft polenta and gremolata and dessert is Lauren’s famous mud cake. Pete and Manu state that it is a bold move to put your name to a dish so it will have to be good. They get back from Coles and set up their restaurant. They have eaten into their cooking time by 20 minutes. Carmine starts on the entree while Lauren starts on the dessert. They purchased mussels with the beards removed to save them some time, but upon inspection there was still some with beards and a lot of prep to do. With an hour to go, Lauren was almost finished her mud cake, but they could either cook the cake or the lamb shanks. They decide to go with the cake and let their guests wait for their main. Lauren makes some ice cream to go with the cake for dessert. The doorbell rings and the guests are here. They are seated at the instant restaurant “32” and Lauren and Carmine get back into the kitchen and check on the cakes. Lauren is very happy with her cakes and she takes them out of the oven. Lauren browns the lamb shanks on the stove and realises that the butcher hasn’t given them 14 and now they will have none to taste. Pete and Manu arrive and are seated at the instant restaurant. The menu is revealed. Some of the contestants are not fans of shellfish so they are not sure how they’ll go. Gareth mentions strategic scoring at the table and Lisa and Monique are not impressed. Monique says that it’s unfair for him to mention it. Lisa says she finds his comments really offensive. They all decide to move on. Back in the kitchen Lauren and Carmine are working on the broth for the cockles and mussels. They watch the pots of the shellfish and wait until they open up. Lauren strains the broth away from the shellfish so they don’t continue cooking in the broth. They place the shellfish into individual bowls and and then re-add the broth. They take the dish out to the judges. Pete and Manu taste the entree. Lauren says she loves the dish as it’s amazeballs. Manu says it’s fantastic, beautiful. He says simple dishes are the hardest to make. His only criticism is that he would have liked a mountain of it. Pete says it’s liquid gold. It was beautiful home cooking. He loved the presentation. Manu says they have set the bar very high for themselves tonight. The other guests taste the dish. Some of the guests really like the dish, some don’t. Manu heads back into the kitchen to see what Lauren and Carmine are up to. He asks if there is any leftover broth, and there is, so he asks for a cup of the broth and drinks it in the kitchen. Lauren asks if he would like a take home pack, he says yes, so she packs him some broth in a take-away container with his name on it. Lauren starts on the polenta. She stirs it consistently and then season it and add cheese. Carmine makes the gremolata for the lamb shank main. They take the lamb shanks out of the oven and are happy with how it’s cooked. They plate it up and take it out to the judges. Pete and Manu taste the main course. Manu says the smell of the dish was very inviting and the meat was falling off the bone. The sauce was too thick but the polenta was very bland. Pete says where’s the sauce? He says the polenta could have been great but it was under seasoned. The other guests really enjoy the dish. Monique finds a hair in her dish so she is not impressed. Some of the guests question the flavour of the polenta and the lack of sauce. Kel asks why Monique didn’t mention the hair in her dish in her critique. Paige says Lisa and Monique have been very critical of everyone’s dishes until they have been accused of strategic scoring and now they suddenly love everything. Lauren and Carmine are back in the kitchen. Lauren turns the cakes out of their tins. Carmine makes the raspberry coulis. Lauren is making a chocolate mirror glaze. As she’s cooking it she says it’s not working. Suddenly it turns around and she can see it working. Lauren tops her cake with the glaze. They plate the dish up and take it out to the judges. Pete and Manu taste the mud cake. Pete says that putting your name onto a dish is brave, if it works. Unfortunately it did not work today. The cake was light and crumbly, not dense like a mud cake should be. The glaze is sugary and gritty. The ice-cream is icy and lacking in flavour. He is quite disappointed. Manu says the cake is not a “mud” cake, this cake does not have the characteristic of a real mud cake. The other guests taste the cake. They agree that it is not a mud cake. Some say the cake is dry, the ganache is gritty and the ice-cream is icy. Lisa says she would be ashamed to put her name on this cake. It’s time for the guests to score their meals. 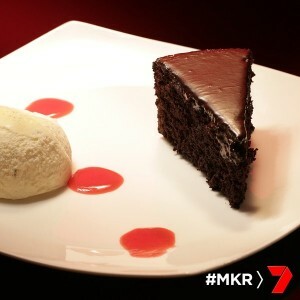 The scores will be revealed back at MKR headquarters. Pete and Manu welcome the teams to MKR headquarters. He says none of the teams are safe right at the moment. Pete says lets have a look at the MKR leaderboard where Rosie and Paige are at the top. It’s time for Carmine and Lauren’s scores. Pete and Manu reveal that it is not just the scores that count, it is the difference in scores which will determine who will be eliminated. The teams whose difference was the worst was Hazel and Lisa and Monique and Sarah. They have been eliminated from My Kitchen Rules. The rest of the teams enter. Pete and Manu inform everyone that the top teams from the original round are safe from elimination, they are Cookie and Chris, Luciano and Martino and Giani and Zana.